Just in case you still need an a quick and easy dessert for any Labor Day Weekend festivities, I am posting this a week early. Although I generally avoid mixes and pre-made desserts, everyone needs a couple quick go-to recipes for those impromptu barbecues and summer parties. 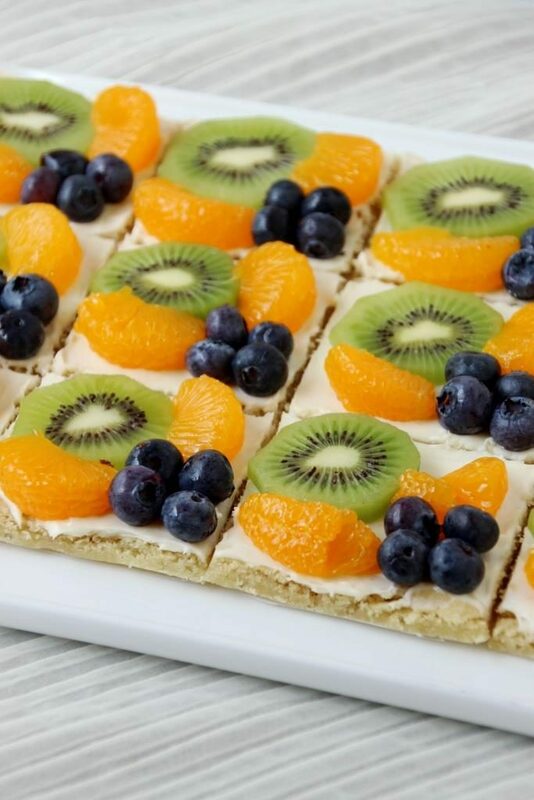 Usually I make brownies because the Ghirardelli mixes are fantastic, but when I want to bring a lighter or non-chocolate dessert and don’t have the time for cupcakes or lemon pie spoons, I’ll tend towards fruit pizza or (peanut butter Cheerio treats). Made with a store-bought cookie dough, the longest step is preparing the fruit. It can be put together in less than an hour, assuming you have all the ingredients, and is a great crowd pleaser. Although any fruit can be used, my favorite options are strawberries, kiwis, raspberries and blueberries. The first two can be sliced easily whereas the latter two options require no cutting. I usually opt for a combination of fruits as it’s both delicious and prettier. In general I just use what I have on hand or what looked good at the store, which this time happened to be kiwi, blueberries, and mandarins. You really can’t go wrong other as long as you are careful to either not choose fruit that browns quickly, or to serve everything promptly. Think of the pizzas as your palette and choose whatever flavor combinations you like best. I did all mine the same, but you can certainly do each slice differently if you don’t have enough of a fruit, or just to allow people to pick their flavors. Since the cookies are pre-sliced, it’s easy to lay out each one identically or differently, and they’ll be ready to serve right away. Clearly you could also use a pizza pan for the normal round shape and slice into wedges, but I find the squares are easier to handle, less inclined to break, and just as pretty. 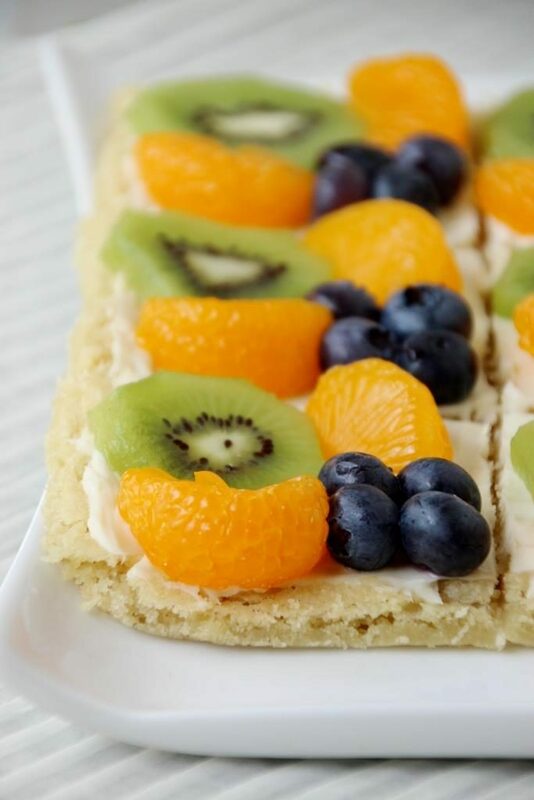 Despite most fruit pizzas being topped with some kind of glaze over the fruit, I never add one. 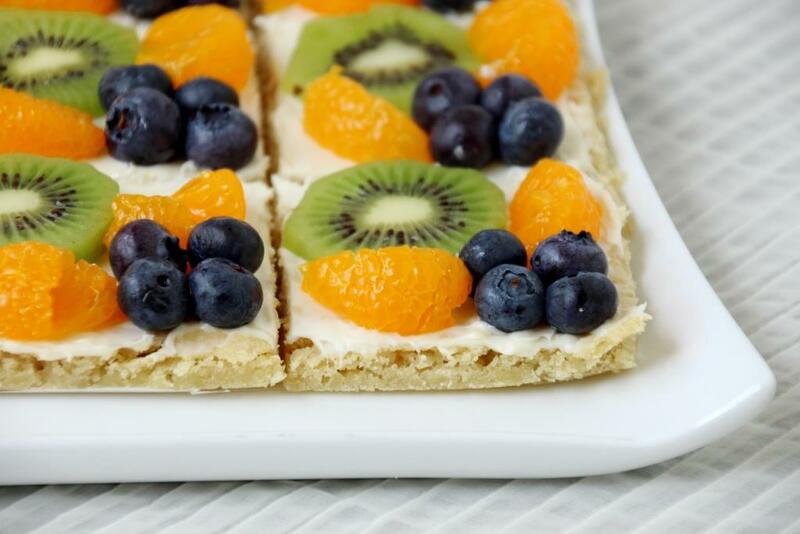 The cookies and cream cheese frosting are already plenty sweet and the fresh fruit really shines if it isn’t drenched in extra sugar and fruit juice. It also saves an extra several minutes of prep time which is great since this is supposed to be a quick dessert. Although I kept it simple this time, another delicious option is to add a spice to your cream cheese frosting. I keep it relatively low sugar since the cookies have plenty on their own, but the addition of some cinnamon, cardamom, nutmeg, chipotle, or whatever you think would blend with your fruit selection would be an awesome way to add a little pizzazz. Start with 1/8 – 1/4 teaspoon and then add more as necessary. And if you’re not pressed for time, you can absolutely substitute your own sugar cookie recipe! Wash and slice the fruit (if necessary) laying it on paper towels to soak up excess water. Spray the edges of a quarter or half cookie sheet (ideally one with a lip) with cooking spray, then line with parchment paper, allowing the paper to overhang the long edges of the pan. Press dough evenly in the bottom of the pan (if you’re using a normal-sized cookie sheet, it will only fill half the pan), use a rolling pin to smooth at the end. Bake about 20 minutes or until golden brown, then cool completely. Run a butter knife along the edges of the pan, then use the parchment paper to gently lift the whole batch out onto a cutting board (or the counter). Use a pizza cutter or a sharp knife to trim the raised edges (optional, but it makes it easier to spread the frosting). At medium speed, beat cream cheese, sugar, and vanilla with an electric mixer until light and fluffy, and spread evenly over cooled crust. Using a knife or plastic pizza cutter, cut the crust into 8-12 servings3, or whatever size you want. If your pan is lipped, make sure you specifically cut the edges as a pizza cutter won’t reach there. Arrange the fruit on top4, keeping with in the guidelines for easy serving. Pro tip: use the parchment paper to move the cookies all at once back to your pan or your serving platter, then cut the extra paper away so it doesn’t show. 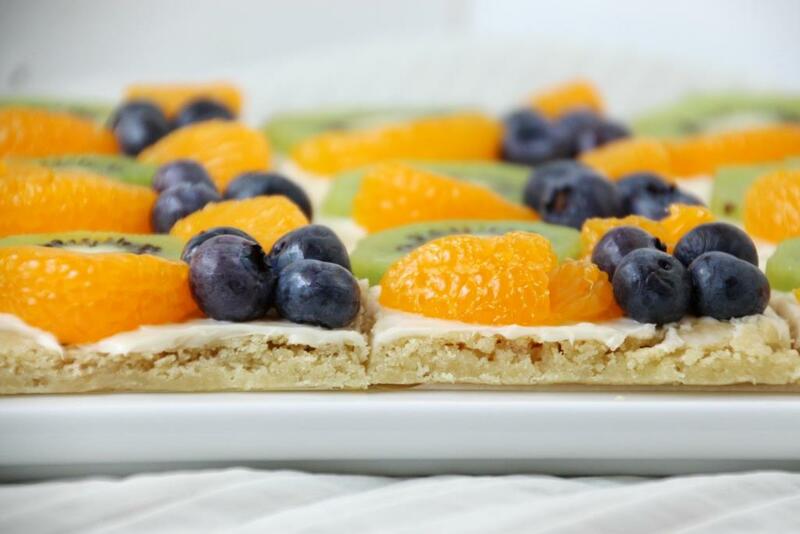 Fruit pizza is just fine on the counter for a few hours, but cover and refrigerate leftovers overnight. The cookies are best on day one as they will get much softer in the fridge. For a make-ahead option, bake the cookies and leave them on the counter, make the frosting and store it in the fridge, slice and drain the fruits and store them in the fridge, then assemble the next day. 1 This is enough to fill a quarter-sheet pan. I love having this size around and am actually thinking I’d like to have two. If you only have half-sheet pans (normal size), then just press the dough into half of the pan, or double the recipe to make 24 servings. 2 Lower fat (or fat-free) cream cheese will work just fine. 3 This makes enough frosting for a thin coating, so if you like lots of frosting you may want to double it. 4 You don’t have to pre-cut the sections (say, if you want to make an American flag pattern) but it makes it much easier and less messy to serve and eat later. 5 If you’re using very juicy fruit, avoid putting it on more than a couple hours in advance if possible. Hello and Happy Holidays friends! Hope you’re having an appropriately white or warm season depending on your location. I am visiting my family in Alaska for the holidays and it’s been pleasantly snowy here – quite the change from last year’s raining nonsense. Apologies for the late post, time at home always seems to go by much more quickly than real life. In any case, this morning I have another easy pastry recipe to share. The overwhelming popularity of my Cream Cheese Danishes led me to try another style. A few months ago I saw a braided Nutella bread that looked beautiful. As you may now be aware, I am not a fan of Nutella but I really loved the idea of a twisted bread with a contrasting filling. Filing it away for future reference, several months passed before I took up the project. 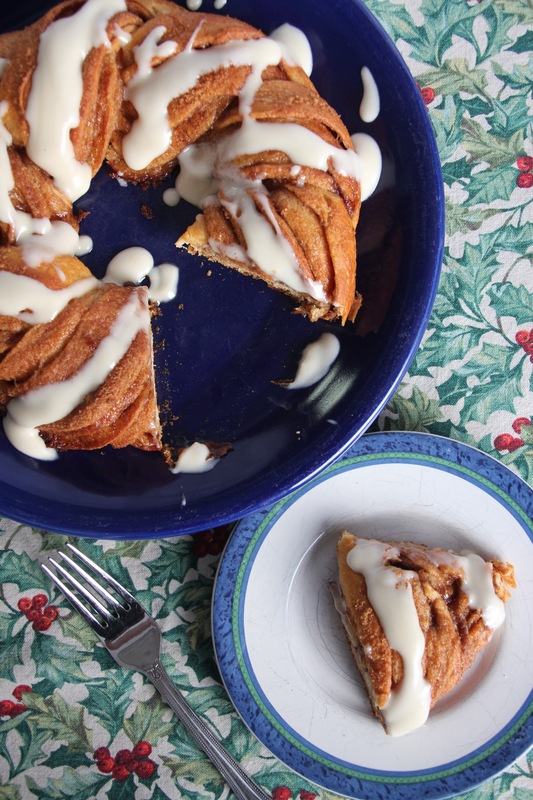 I love cinnamon rolls any time of year but for some reason I always crave them even more around Christmas. The homemade version is quite a bit of work which makes them extra special (and extra tasty) so we don’t make them very often, except sometimes for Thanksgiving or Christmas breakfast. Pillsbury makes actual cinnamon rolls, of course, which are surprisingly good, but feel somewhat commonplace as far as excitement goes. 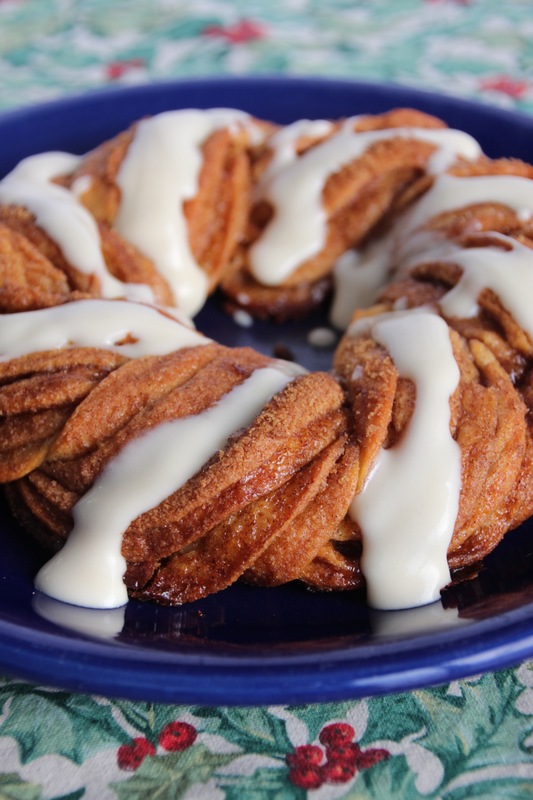 The idea for twisted bread returned to me and twisted cinnamon rolls were born. Using an easy cinnamon sugar filling and the pre-made dough makes for a super quick breakfast or pretty dessert without the hassle and tediousness of dealing with yeast and rising times. 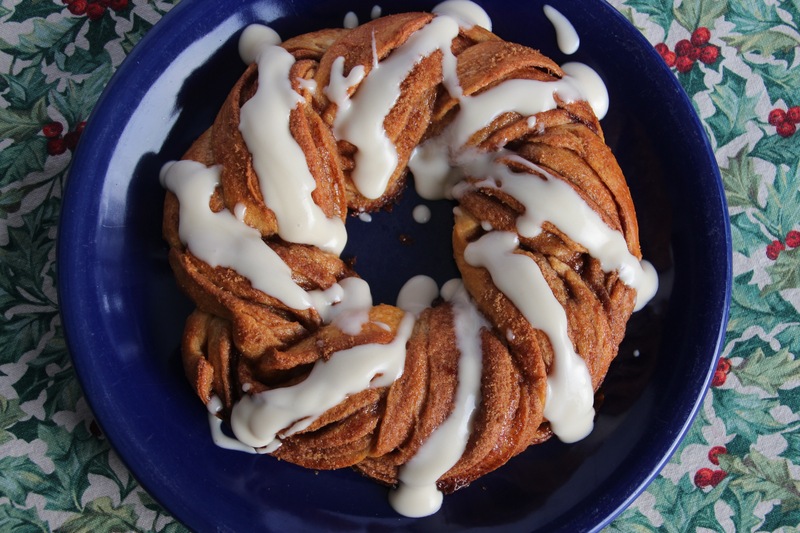 Small enough for the family or simple enough to make several for the office, these are a pretty way to switch up the traditional and delicious flavors of a cinnamon roll. Sure to please both the kids and the coworkers, this is a great holiday option for all the busy people out there. Preheat oven to 375 degrees Fahrenheit. Line a baking sheet with a silicon baking mat or parchment paper. On an extra sheet of parchment paper, unroll the dough and pinch the seams together. Put face down on the prepared baking sheet and then gently peel off the parchment paper. Pinch the seams together from this side also. Spread 2 Tbsp butter over the dough. Mix together brown sugar and cinnamon until well mixed, then sprinkle evenly over the dough, leaving about 1/2 inch clear on one long end. From the other long end, gently roll up the dough and then pinch closed. Carefully cut down longwise down the center of the rolled dough (a plastic pizza cutter works great, and won’t damage your silicon mats or your baking sheet). Gently turn the cut side facing up. Carefully lift one side and place it over the other dough strip, repeating on the same side to form a twist. Gently move into a circle and pinch the ends together. Bake for about 18 minutes. It should be browned on the top and not doughy in the middle. Meanwhile, prepare the frosting: beat together cream cheese and 2 Tbsp butter until fluffy, then beat in powdered sugar and vanilla. Stir in milk 1 tablespoon at a time until it reaches your desired consistency – less milk for spreading, more milk for drizzling. Serve immediately with coffee for a lovely snack, or eggs and fruit for a more well-rounded breakfast. 1 Any of the styles should work, although they may all bake up slightly differently, so watch carefully and adjust the baking time accordingly. For example, the “big and flaky” version would probably need a couple more minutes in the oven.